Ductal carcinoma is a breast cancer that starts inside the milk ducts of the breast. Ductal carcinoma in situ (DCIS) means that this ductal cancer has not spread beyond the milk duct into any of the surrounding breast tissue, and for that reason, DCIS is considered "non-invasive". DCIS is highly curable with lumpectomy. Sometimes, radiation is also used to treat the DCIS after lumpectomy. Once the cancer spreads beyond the duct into the surrounding tissue, it is then considered an "invasive" breast cancer. An invasive breast cancer has the ability to spread or metastasize to other parts of the breast, to the lymph nodes, and to distant organs, like the lungs, liver or brain. Obviously, if the cancer is not found, diagnosed and treated until after it has spread out of the milk ducts, survivability decreases and it may be fatal. That is why it is so important that any abnormality on a mammogram, breast ultrasound, or breast MRI be followed-up and diagnosed immediately. Our law firm frequently sees cases of women who have calcifications or other signs of ductal carcinoma on breast mammograms and ultrasounds, but the doctor does not properly identify the abnormality when it is curable. Too often, the signs of DCIS are not seen or are ignored.DCIS is usually found by mammogram. It is rare for your doctor to feel a lump or other abnormality with DCIS. Typically, DCIS is seen on mammogram as tiny specks of calcium, called calcifications or microcalcifications, within the milk ducts of the breast. Microcalcifications are the only reliable way to identify non-invasive breast cancer. Microcalcifications are deposits of salts, calcium, that ocur as a result of secretions trapped inside the duct. 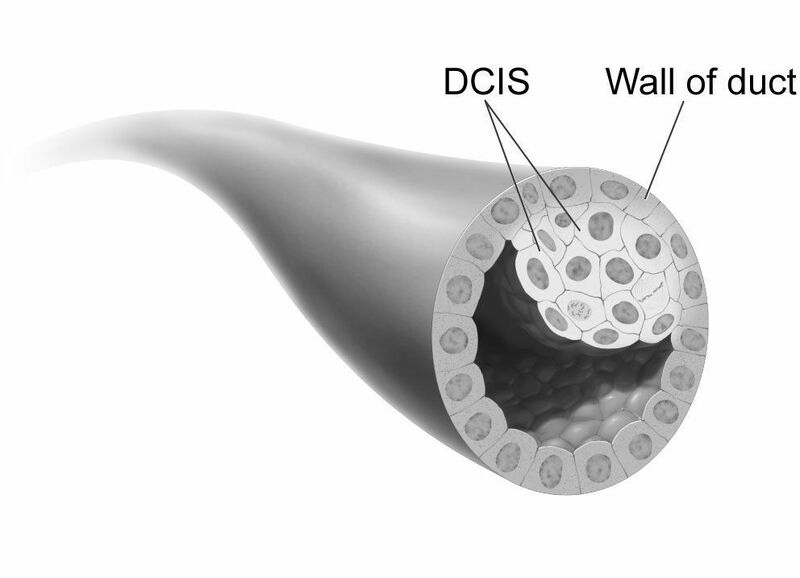 That entrapment results from cancer growing inside the duct (DCIS). Frequently, a doctor calls such calcifications "benign", meaning that they are not cancer. However, to determine whether calcifications are benign or cancer, it is necessary for your doctor to perform magnified views of the calcifications. In a magnification view, the calcifications in the breast are magnified so that they appear large and can be more easily evaluated. It is also helpful to obtain spot films of the calcifications. A spot film is where you take the suspicious area of the breast and compress it so that you are taking a mammogram of only the suspicious area. This allows you to enhance the sharpness of the image. Calcifications that are suspicious for breast cancer are calcifications that are linear, that is a single continous line (as opposed to random); those that are different sizes and shapes; and those that have sharp edges (as opposed to smooth round contours). If your doctor finds suspicious calcifications in your breast, you will want to get a biopsy of the suspicious area. This can be done with fine needle biopsy in which a hollow needle is inserted into the suspicious area and cells from the area removed. They are then evaluated under a microscope by a pathologist, a doctor specializing in the evaluation of tissue or cells removed from the breast. Another type of biopsy is a core needle biopsy. After making a small incision in the breast, a larger needle is inserted and tissue from the suspicious area is removed and evaluated under a microscope by a pathologist. The pathologist will examine the tissue from your biopsy and determine whether there are cancer cells present. If the pathologist determines that you have DCIS, there are several options for treatment. The most common treatment for DCIS is lumpectomy followed by radiation. Another option is lumpectomy without radiation. Some patients have mastectomy, complete removal of the breast. This may be necessary if the DCIS overs a large area or is present in multiple areas of the breast. If the DCIS is estrogen receptor positive, some doctors recommend hormonal therapy after surgery. Chemotherapy is generally not required. Medical malpractice is a terrifying thing, especially since it can happen to anybody in their most desperate time of need. Even prestigious institutions such as UPMC Children's Hospital of Pittsburgh and UPMC Presbyterian Shadyside have had medical malpractice cases come out of them. If you or your loved one has suffered from medical malpractice in Pittsburgh, PA contact the skilled medical malpractice attorneys at Berger & Lagnese, LLC. Our office is located at 310 Grant St #720, Pittsburgh, PA 15219 and consultations can be scheduled either online or via phone, at (412) 471-4300.